New ALL NATURAL Aromatherapy Soy Wax Candles infused with Pure Essential Oils. Available in 3 excellent aromatic blends. 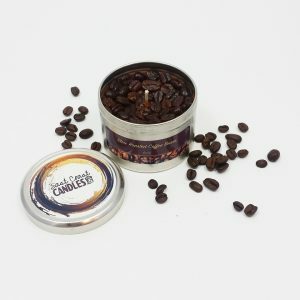 These hand poured 8oz tins feature 3 wicks for wonderful ambient lighting and amazing release of aroma. Approximate burn time 25+ hours. WAKEY WAKEY: A blend of frankincense, peppermint & lemon essential oil. RELAX & RESTORE: A blend of eucalyptus lemon, cedarwood, lavender & tea tree essential oil. SLEEP EASY: A blend of lavender & chamomile. other items. Keep wax free of matches, wick trimmings, or other flammable materials. Burn only on a stable heat resistant surface for not more than 4 hours at a time. Keep out of drafts. Discontinue use when only 1/2” of wax is left in the bottom. Do not move candle while burning or if wax is melted. Keep out of reach of children & pets.